In stock -This product will ship today if ordered within the next 4 hours and 15 minutes. 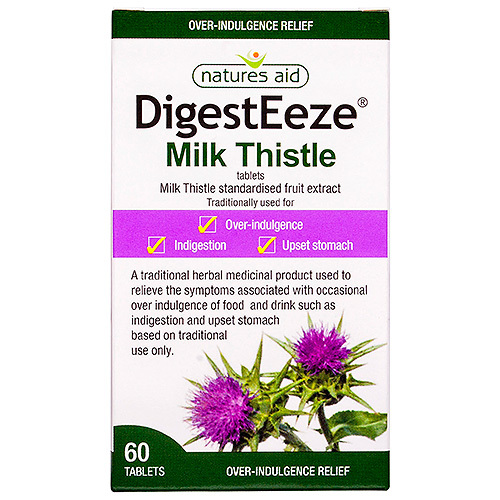 Natures Aid DigestEeze (Milk Thistle) is a traditional herbal medicinal product used to relieve the symptoms associated with occasional over indulgence of food and drink such as indigestion and upset stomach based on traditional use only. Milk Thistle fruits, Calcium Hydrogen Phosphate anhydrous Cellulose Microcrystalline, Sillica Colloidal hydrated, Croscarmellose Sodium, Magnesium Citrate. Adults and Elderly swallow one to two tablets twice daily, Swallow the tablet whole with some liquid. 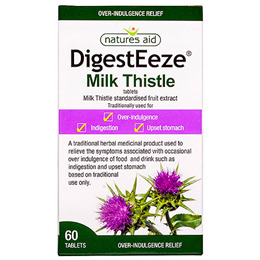 Below are reviews of Natures Aid DigestEeze - Milk Thistle - 60 Tablets by bodykind customers. If you have tried this product we'd love to hear what you think so please leave a review.